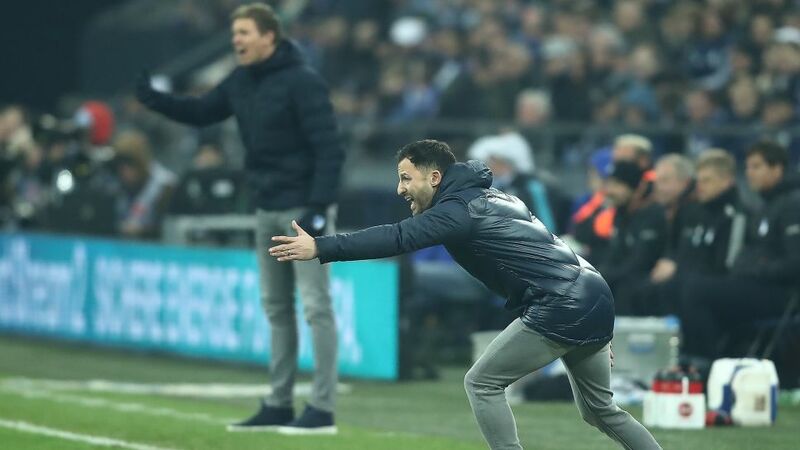 The football aside, one of the most fascinating aspects of Schalke's fixture at home to Hoffenheim on Matchday 23 was the touchline battle of wits between the two youngest head coaches in Bundesliga history: Domenico Tedesco, 32, and Julian Nagelsmann, 30. The duo are close friends, having taken their coaching licenses together and worked as colleagues at Hoffenheim, with Tedesco taking over the reins of the U-19s when Nagelsmann was appointed head coach in 2016. Saturday's encounter was just the second time they had faced off on opposing sides of the pitch. In their first meeting, on Matchday 6 earlier this season, Nagelsmann outsmarted his former classmate in a 2-0 win over the Royal Blues. Tedesco was not about to let that happen a second time. On Saturday, Thilo Kehrer headed the hosts in front in the eighth minute before Breel Embolo doubled the advantage 20 minutes later when he capitalised on a mistake by Kevin Vogt, having also had a goal ruled out for offside in between times. "We saw two different halves today," Tedesco analysed afterwards. "In the first 45 minutes we played a diamond in midfield so that we could have a certain physicality in the number ten role and then have two players going for the second balls. That caused Hoffenheim a few problems. We were robust and our courage made us dangerous in front of goal. That was very good. We deserved to get the second goal before the break." Although Andrej Kramaric pulled one back for Hoffenheim in the second half, ultimately Schalke were able to hold on for a 2-1 victory. Tedesco explained what changed after the break: "In the second half Hoffenheim switched to a 3-4-3 formation, which is why we also changed to a 3-4-3 pretty quickly. Towards the end they went with a 4-3-3, so we switched to a 5-2-1-2, like we did recently away at Bayern Munich, so that we could defend high and aggressively out wide. That didn't work out too well in the end, though, because we were too hesitant in our execution. Overall we played well, but there's still plenty we can improve on." The result means his head-to-head score with Nagelsmann stands at 1-1, while also making his points-per-game average (1.60; 10 wins from 23 matches) almost identical to that of Nagelsamnn (1.63; 31 wins from 71). Perhaps more importantly, Schalke pulled six points clear of their visitors in what is becoming an increasingly tight contest for European qualification, with 10 teams – Hoffenheim included - vying for five places. "Congratulations to Domenico and Schalke," said Nagelsmann at full time. "We lost the game in the first 30 minutes. We were too sleepy and not hungry enough. We struggled to get to grips with Schalke and our positioning wasn't good. On top of that, we committed too many fouls in that period, and set-pieces are one of Schalke's strengths. We found that out first-hand for their first goal. "We basically scored their second one for them – we were too defensive," he continued. "As a rule we want to play out from the back, but mistakes can happen. It was obviously a goal we could've avoided conceding. I thought we were better in the second half but just didn't get rewarded for it. It's not easy being 2-0 down against a team that defends so well." Click here for the Schalke - Hoffenheim Match Centre!